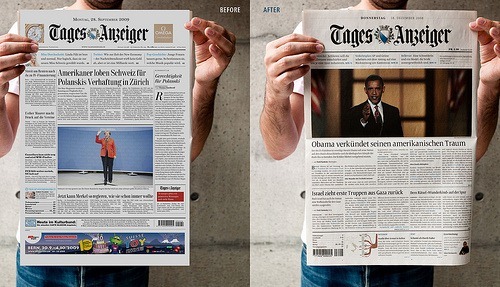 Thanks to SwissMiss I just stumbled on this post from Oliver Reichenstein from Information Architects about their pitch for the redesign of Swiss newspaper Tages-Anzeiger. In the end their pitch didn’t win, but they had some great ideas in there. I especially like their idea of highlighting the key words in an article in blue to make scanning stories easier. They would also use those keywords to simplify finding the same articles on the website. 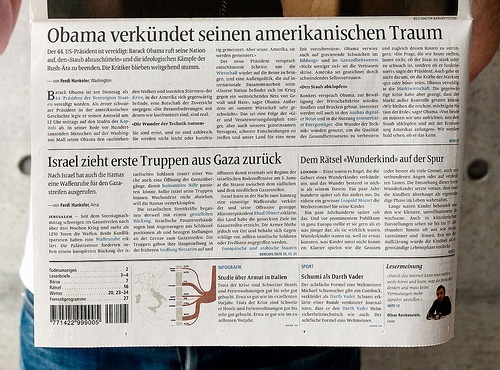 In a world where newspapers are rapidly loosing ground to web based competition, ideas like these might help make the old paper media more relevant to readers who have grown used to the web. I thought the article was an interesting read.